Fallen leaves and accumulated debris can create many problems for homes and commercial buildings. Gutters should be cleared of these clogging materials at least once each year. Yaskara Painting LLC is a name you can trust for your gutter cleaning. Prevent Water Damage - Gutters protect your home or building from water damage. When gutters are clogged, water pools and runs over the gutter uncontrolled off your roof. This leads to eroding landscaping and pooling next to your foundation. With prolonged or severe rains, it is only a matter of time before this runoff water penetrates the foundation and seeps into your home or building. Let Yaskara Painting LLC clean your gutters and prevent further water damage. Stop Structural Damage - As gutters fill with debris and pooled water, they become heavy. This causes increased stress on your eaves. Nails become unsecured and wood begins to crack. 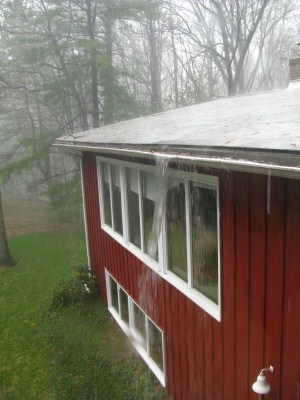 A heavy rain or an ice dam is all it may take to pull a clogged gutter down. Also, ants and bees find their homes in and around damp, clogged gutters. Yaskara Painting LLC will help preserve your home. Save You Money and Time - Yaskara Painting LLC's gutter cleaning technicians are up and down ladders all day. Save the trouble and time of lugging around a hefty ladder and pulling gunk out of your clogged gutters. Very affordably, Yaskara Painting LLC will quickly and completely clean your gutters, saving you time and maintaining investment. Help Keep You Safe - Ever fallen off a ladder or roof? It can ruin your day! Yaskara Painting LLC's trained technicians are practiced in roof and ladder safety. We'll do the gutter cleaning while you remain safely on land! Also, did you know that various insects often make homes in or near gutters? Who wants to be stung when pulling muck from a gutter? Do something safe while Yaskara Painting LLC does the risking job of climbing ladders and the messing job of pulling gunk. Yaskara Painting LLC is a leading provider of gutter cleaning services. Our expert technicians have years of experience on roofs and ladders and can make your house or building gutters work again.